Next week the Iranian and Russian presidents, along with the UN Secretary-General, will visit China to attend an international summit, according to China’s Foreign Ministry. “At the invitation of President Xi Jinping, President of the Russian Federation Vladimir Putin will pay a state visit to China from May 20 to 21 and attend the 4th Conference on Interaction and Confidence Building Measures in Asia (CICA) Summit in Shanghai. “At the invitation of President Xi Jinping, President of the Islamic Republic of Iran Hassan Rouhani will pay a state visit to China from May 20 to 22 and attend the 4th CICA Summit in Shanghai. 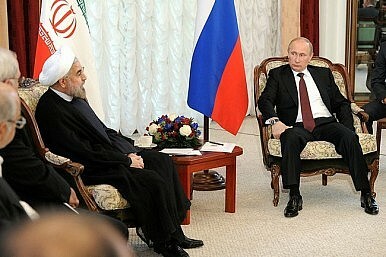 The visits by Russian President Putin and Iranian President Rouhani are not unexpected. There have been a number of meetings in recent weeks between lower level officials that were seen as paving the way for the heads of state visits. For example, in March of this year China’s state media noted in passing that Xi had said he looked forward to Putin’s visit to China in the near future. Then, last month, Russian Foreign Minister Sergey Lavrov visited China, where he met with his counterpart, Foreign Minister Wang Yi as well as President Xi. Earlier this month, China and Russia also announced their plans to hold a military drill in the East China Sea in late May. While not unexpected, the visits — particularly Putin’s trip — promise to be significant. Most importantly, Russia and China are expected to ink a huge natural gas deal that they have been negotiating for years. The sticking point for the negotiations has reportedly been the issue of price, and it’s likely that Russia has caved to China on the issue owing to the pressure it is under because of the Ukraine crisis. The simultaneous visits of Putin, Ban and Rouhani may also offer an opportunity to discuss the ongoing negotiations over Iran’s nuclear program between the P5+1 and Tehran. Diplomats are meeting in Europe this week to begin drafting an agreement before the July 20 deadline.